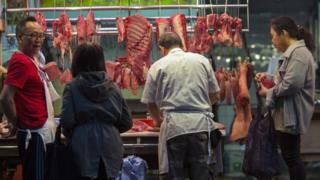 China has lifted a total ban on imports of Brazilian meat imposed over allegations that companies have been selling unsafe produce for years. Brazil's Agriculture Minister Blairo Maggi says the move follows a "giant effort" by officials to explain the investigation into tainted food. Chile and Egypt have also lifted their bans, the Brazilian government says. Brazil is the world's biggest red meat and poultry exporter, selling more than $12bn (£9.7bn) a year. The scandal was triggered by a huge federal police operation last week that found evidence that meat-packers had been selling rotten and substandard produce for several years. China and Chile will keep their import bans for the 21 Brazilian units under investigation by the operation, the government said. "Lifting this suspension was the result of a giant effort by Brazil to explain that the investigation targeted the conduct of individuals and not the quality of the meat," Mr Maggi told Reuters news agency. In a statement, Brazil's President Michel Temer said the moves "reaffirm the trust of the international community in our sanitary control, robust and recognized around the world". Brazil meat exports amount to nearly $14bn (£11bn) each year. They have fallen sharply since the scandal broke out. The European Union, which is the main importer of Brazilian meat after China and Hong Kong, announced on Friday that it would reject produce from the plants being investigated. Health and Food Commissioner Vytenis Andriukaitis will visit Brazil this week to hold emergency meetings with officials and industry leaders before the EU decides on what measures it will adopt. Brazilian investigators allege that some managers bribed health inspectors and politicians to get government certificates for their products. The scandal caused a 22% drop in weekly average exports of pork and poultry, Reuters reports. There was no data related to beef exports.